Home Gallup Poll Shows Record Support For Legal Marijuana…..Again! We are certainly living in the most progressive time regarding marijuana since probation early last century. 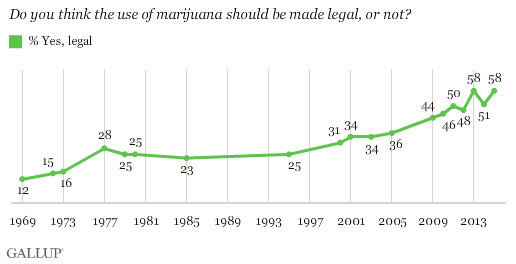 A year ago, approval for marijuana legalization was at a solid 54% according to national Gallup Polls. Now, the number has rose to 58% – more than likely because marijuana is medically legal in 27 states, and recreationally legal in 4 states (soon to be 5 or 6 if you include Ohio and California), and many are now starting to see the tax revenue, job creation, and the fact that kids aren’t spiraling into a life of crime and heroin addiction because marijuana was made legal. Furthermore, cannabis has recently been proven by the federal government to be an actual cure for some types of cancer, along with its miracle curing power to treat seizures, autism, PTSD, and other illness and conditions. About 58 percent of Americans support marijuana legalization, according to a new Gallup poll released Wednesday. Support for legalization has been steadily climbing for decades, driven largely by more support among younger Americans. 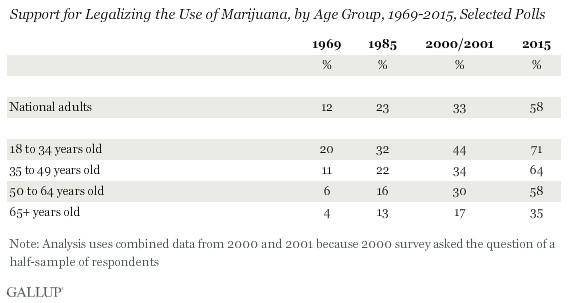 According to Gallup, 71 percent of Americans ages 18 to 34 now back pot legalization. These polls are particularly pertinent since it’s a presidential election year. None of the presidential candidates have endorsed legalization, although Bernie Sanderssuggestedin the first Democratic debate that he would likely support legalization if it came to a vote in his state’s ballot. That puts Sanders not just to the left of Hillary Clinton on pot, but also closer to the Democratic base — Gallup and Pew have found that around six in 10 Democrats back legalization — and, increasingly, to all Americans. But more than the political party breakdown, it’s the age breakdown that matters to legalization advocates. Since younger Americans increasingly tend to back legalizing marijuana, many advocates feel it’s only a matter of time until the country legalizes pot asyoung people grow up and vote. For advocates, then, it’s more about howand when to legalize, rather than if.